This year was my 3rd year to race Folsom (formerly Folsom International Triathlonor FIT , currently Folsom Olympic Distance Triathlon or FODT). I had goals, some that were met, some that were not. Overall my time was 10 minutes slower than last year (not a goal) but it came out okay. The Swim –If you’ve been following this blog for a few years you know that 2 out of 2 prior runnings of this race (2007, 2008)had me coming out of the water, traversing the nasty river rock and falling down with an extremely painful cramp in my calf. My first goal for this race was to not have this happen. I swam kind of easy, counting to 100 over and over again and as I approached the swim out I did the breast stroke for a little bit to stretch my legs. It worked! I got out of the water sans cramp. Mission accomplished! T1 – as always I couldn’t get my wetsuit off over my feet. I need to work on this because it kills me every time. There was not a single bike in the FMRC rack I was in but this was to be expected because the only other woman in my wave I could think of in that moment is a really strong athlete and really competitive. There was a 3rd rack I didn’t check but if I had I would have noticed 1 bike and remembered there were 2 in my wave. The Bike – I rode 50 miles on Saturday so my legs had a little wear and tear on them and I could hear them whimpering softly but I felt okay. I passed people and people passed me. I never once saw a woman in my AG which which made me think I was either dead last out of the water or had a phenomenal swim. I didn’t know so I let it go. I did get passed at mile 7 by the other woman in my club and in my swim wave who also happens to be in my New Triathlete Program. I’m going to have to strip her newbie status immediately! I tried to ride as hard as I could but made a conscience decision not to watch my speed on my bike computer. Big mistake – huge mistake. Percieved effort is crap for me. Numbers rule. Lesson learned. Someone is NOT in her happy place! 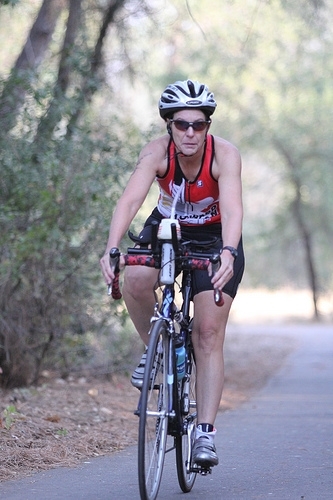 T2 – As I came into T2 I heard the announcer call my name and the name of another woman and I heard him say “Number 1 and 2 in our later age group” which was secret code for “old ladies division” but the young guys never say stuff like that. Anyhow, there were these 2 women standing by my full rack and I said excuse me and then I said “did he just say that? Did he just say #1 and #2?” Of course they had no idea because they were just hanging out in transition shucking and jiving while their friends/Sos raced but they said, “Yeah!” so I said “OMG – no pressure there!” and I took off. That bit of misinformation was key for me. I had to keep running lest I made it out of T2 before the other woman did. I had to put some distance between us so I ran as best I could. I passed the first water station and just kept going since I had about 5 gallons of water in me. The Run – The run was really hard for me. It seemed like about 100 miles to the mile 1 marker but I just kept going with the pep talk (you can do it! just keep running! legs? what legs? go! go! go!). My goal was to put as much space between her and me so she could never catch me, assuming I got out there first. I didn’t see her ahead of me so I stuck with that assumption. It was a huge struggle, though. I am eternally grateful to the woman who saw me take a couple of walking steps who called out “you’re almost to the turn around!” so I ran. I did my best not to look back and just kept running knowing I could search for my adversary after the turn around. There she was, about a 1/2 mile behind me – too close for comfort. I thought about giving in to my desire to walk and then I thought “suppose you give up 2nd for 3rd – how would THAT be, Missy??! !” and I kept running. The brain is a powerful enemy in these races and mine was saying “WHO CARES??!! – JUST WALK IT!” And I gave in – for a count of 10 and then I ran again. I thought about how stupid it is that I race and wondered, for the 9,000th time why I can’t just spend my time kayaking and wind surfing like a normal middle-aged woman. I walked up a hill encouraged by a42 year old man who said “that’s right – walk the hills, why not?” and I hate that but then I realized I was right behind the guy who had run it (M 49) so I started running and let that guy be my pacer. Right before the finish of Folsom you go off the paved trail and run on a rocky, dirt trail. This is where the lady passed me 2 years ago and then beat me by 18 seconds. This is where I heard foot falls behind me last year and thought “oh no you don’t!” and picked it up to come in 10 seconds before Ms Footfalls who was in my AG. This is where I picked it up again in an effort not to get burned by the enemy behind me. Turns out I really didn’t need to do that but I really did need to be done. I wondered and wondered how I came in 3rd if I was 2nd or 1st in T2 and I realized there was no way. First of all I didn’t get passed by anyone in my AG on the run. Second of all when I look at the results it’s clear that #1 and #2 were way out there by the time I got on the run. They beat me by 37 and 22 minutes respectively. I beat #4 by 20 minutes so I guess I did drop her good and hard. So where did I lose those 10 minutes? How was it that I was unable to reach my main goal for this race – to go sub 3:00?? 1). The swim. My swim time was off by 6 minutes. Holy Moly! I checked times for several other races and everyone was off 2-4 minutes (I’m kind of “special” with 6) so I expect the swim was a bit long. I also suspect I didn’t swim very well. 2). The Bike – if I had been watching my speed I would have gone faster. Plain and simple. Lesson learned. I was 2 minutes slower. On the other hand I rode 50 miles the day before so that was a problem That’s all the more reason I should have gone by speed being that I’m pain averse. 3). The Run – I have not been running enough and I just need to HTFU on the run in general. I was off by 3 minutes and I suspect the 75 miles on the bikein 2 days had quite a bit to do with that. The long ride yesterday was about training for endurance. That’s what I need to be doing. I’m starting to wonder if it’s worth it to race a distance I’m not training for and I really don’t know. That having been said I’ll be doing a sprint on Sept. 20 and then next up is B2B 140.6. I wonder how I’ll feel on that run? This entry was posted in Monday Monday, Racing. Bookmark the permalink. Good job Pamela. You aced the River Rock challenge and came in 3rd. That is fantastic! You go girl! I am so proud of you! Not too bad, 3rd! And with those biking miles before the race, you actually rocked it! Good job! This was not your “A” race so just chalk it up to practice (that is what I do). I know what it is like to have all of those thoughts…some days you got it, some days your don’t. 3rd place ain’t bad! I am not sure kayaking or windsurfing at our age is all that normal either? I always wonder why am I not just doing a Yoga class..
For a training day, this was an outstanding result!! Good for you! Hey, good work woman!! Going by RPE is tough when you’re more fatigued, but only 3 minutes off? We’ll have to work on your mind-body connection. Do not be a slave to technology! On the swim, you can also try just kicking harder as you approach the exit. This increases blood flow, and helps with balance coming out of the water. Re: the wetsuit, do you oil or body glide your ankles? Then just step your way out of the suit… stepping on the legs as you pull up. You showed up, you raced your heart out, (without tapering I might add!) and you placed! Now…swim Sharkfest and place in AG too! Congratulations again! I think you turned in a great performance, even if the time was slower. Conditions are always different too. Bummer about the announcer getting it wrong, but it did help you eat up minutes with that new focus. I sometimes wonder about kayaking instead of this torture too. I was off by 3 minutes and I suspect the 75 miles on the bikein 2 days had quite a bit to do with that. Sounds to me like a pretty good showing! next up b2b, eh? I somehow missed that you were planning on doing an iron distance this year. Silly me. cheering you on! And hey, intensity has its place in endurance training, so shorter races can be training! All this stuff is just so complicated. It makes my head hurt just reading it. Um, just a guess, but next time you might want to forgo the 50 mile taper. 10 minutes (or even more) slower seems completely reasonable given the factors you listed at the end. I HATE when the swim is long – it sets such a downer tone for the rest of the race. Great race, all things considered. Well done.